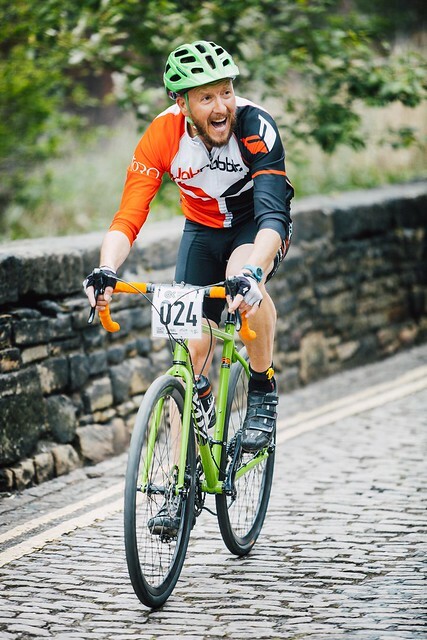 Back in the Autumn, Adam Simmonite, the organiser of the Sheffield Urban Cyclocross race got in touch with Cotic about sponsoring the event to be held in May. 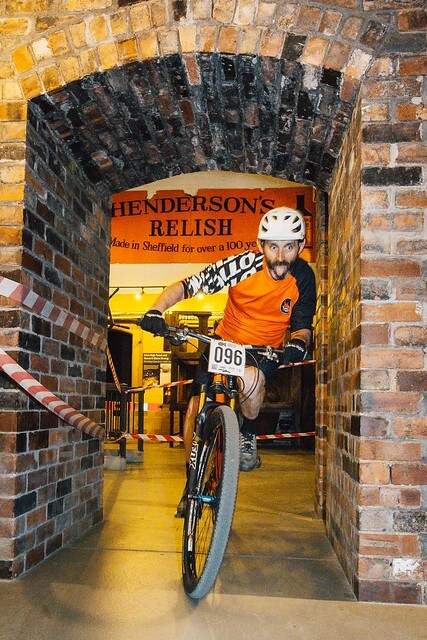 Loads of fine Sheffield folk, getting to ride through a fantastic museum from my childhood, with bar-to-bar action and a pub close by. Perfection. The closest thing I could get to the huge Belgian races or the Single Speed CX World Champs which always appealed. It sounded like a no-brainer! Myself & Will headed up to meet Adam, work out the course and take a load of photos for the promotional material. As we returned in early Feb for another round of course testing, hypothermic and wet, enthusiasm waned. Luckily though, race day last week dawned dry & warm. Will had since thrown in the towel so it was up to me to fly the Cotic flag. Metaphorically and literally! You’d think with two rounds of practice I’d know what I was doing but nope. Somehow I’d landed in Sport category rather than Amateur so I’d better grit my teeth and get on with it. Sign on was a breeze due to the great number of willing marshals and volunteers - bagged my first no '69' raceplate too! We had a couple of laps of practice but as ever, that goes too quick. Spirits were up as I was in a heat with local legends Nick Hamilton, Si Hartley and Tom Newman. 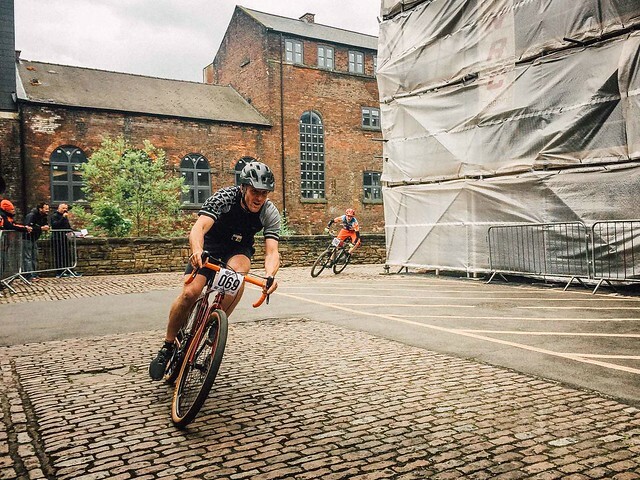 The 'This Is Sheffield’ dual series has taught me the art of the ‘racing elbow’ and with the Le Mans start, the Megadeath (https://dirtmountainbike.com/racing-events/mates-races-sheffield-dh.html ) participants were at a distinct advantage. 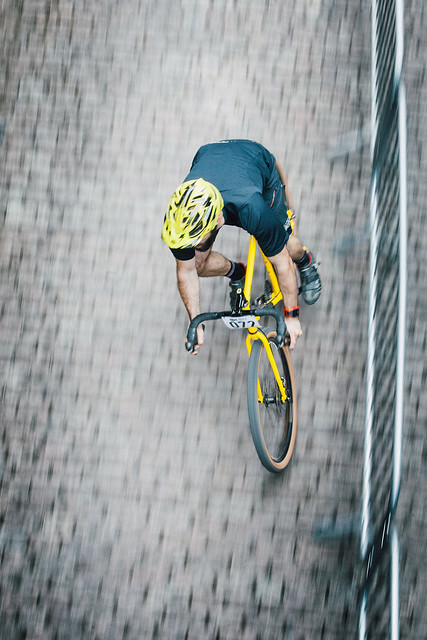 The course was tight with limited overtaking opportunities for the timid. When the flag dropped we had a sprint for the holeshot down the whole length of the cobbled road in front of the museum. 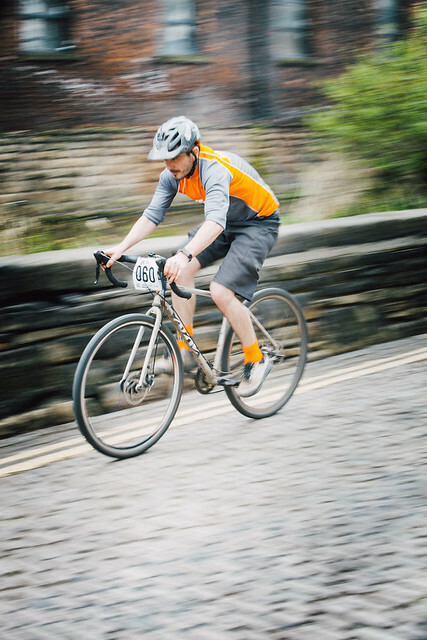 The course dove round the back over some loose gravel, round some hairpins and over a set of doubles borrowed from the Howard St Dual, a few weeks previous. After that it headed towards the carpark for more wooden obstacles (with a cheeky un-taped corner to cut), up the loading ramp (which felt like the Koppenberg after 2 laps! ), into the hall for more wooden features, followed by a run down the stairs and back outside via the Mesters Street. 2 minute laps. 25 minute heats. How bad could this be? I’d opted for our Medium (fast red) Escapade with WTB Horizon40 Road+ tyres. Odyssey plastic BMX pedals were a novel but inspired choice as we were off and on the bikes so much clips would have been a huge hassle. Plus the plastic slid when I ground them on the corners, rather than biting if they were metal. Lastly I eschewed my heavy mtb shoes for my trusty old Nikes - the start was critical and these babies were going to help with the sprint. So the flag dropped, the bull stopped and we were off! Second place on the sprint to Hamilton who went the wrong way twice down the first straight. Lost a couple of places on the first lap at the non-tech parts. Alec Brunson on his yellow 1x11 Escapade went round the outside of me into the hall as if I was a statue. Outside I had a full tussle with Si Hartley - I knew if I let him pass I’d never see him again. The cheeky cut line on the 180 berm helped re-gain another place. A couple of dropped chains from the leaders and miraculously I found myself finishing in 4th and qualifying for the final. To say I went pretty hard would be a doing a disservice to my heart, lungs and legs. Empty, spent, broken, crushed. All that - I was done. The first people I saw at the finish line were my parents: Passing out at my mums feet and vomiting on her shoes was a VERY real possibility so I took myself off to a quiet corner to wipe the blood from my nose and have a little sob. The hour before the final was spent walking around trying to dislodge the knot in my stomach. Racing doesn’t suit me at all… The mood on the start was even more serious, although this time we shared the gate with Rob Friel on his stag do party, wearing a very short skirt. It wasn’t serious at all in fact. With fewer elbows thrown I found myself with the fastest sprint and the holeshot (thank you nike). That lasted about 5 seconds as 5 other riders squeezed past me into the first corner. Racing is frightening! The first lap of the 10 minute final was my fastest of the day but after that I went backwards. Topped off by a jelly-legs crash over the hurdles, I crawled home dead last whilst be-skirted Rob sailed home in Gold medal position. Two Escapade frames were given out in the prize draw and everyone retired to the Pedlars Market just up the road for a well earned beer or three. What a day. The next event is to be held at the infamous Park Hill flats and promises to be more cx based with grass climbs and longer laps. Not sure that will help me much but I’ll be on the start line for sure. Who’s joining me? More details can be found at http://sheffieldurbancx.co.uk/  and photography supplied by http://www.ninewhilefive.co.uk/kicx/ , Emma Peasland and Jason Holme.